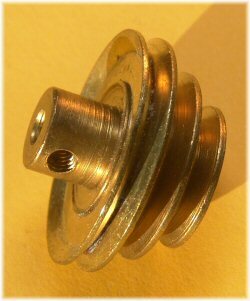 The cone pulley was first announced in the November 1920 Meccano Magazine, and is described as a part "which enables the user to drive a lathe or other machine at three different speeds". It was added to outfits 6 and 7 when all the outfits were substantially reorganised in 1922. It's yet another nonsense Meccano part, really. As far as I can see it's used only in two outfit 6 models, the Lathe and Field Gun, in both cases purely decoratively. Of course, if you have a drill press you will be aware that normally these are arranged in pairs facing opposite directions, such that the belt between the two can select one of three ratios without stretching or running out of true. Since only one was supplied even in the largest outfits, making the Meccano equivalent is impossible. This realisation perhaps led to the part being dropped from all outfits at the next substantial change in 1930, and it never made it into an outfit after that. It continued to be available as a spare part up until 1977, but disappears completely in the 1978 parts listing. There is one major variation with this part. The earlier ones are manufactured from a solid brass section containing the two smaller pulleys, and a pair of brass stampings pressed on the back making up the largest pulley. You can see from the photo to the right what these look like when the large pulley falls off! Below is a picture of a fully intact version of the same thing! You can see the ridge around the back of the largest pulley where the brass section is peened over to trap the two-part pulley. 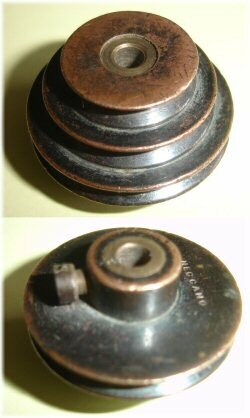 These versions are found single-tapped and double-tapped, but at some point apparently in 1930 this multi-part approach was dropped and the cone pulley was made from a single milled piece of brass (see the top photo on this page). 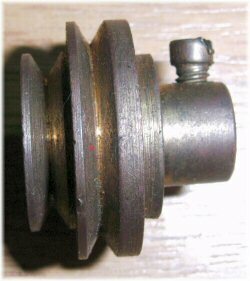 Since this part was mainly supplied between 1922 and 1929, one would expect many of them to be stamped MFEA, but this is a surprisingly unusual form of the cone pulley. I've no idea why, or perhaps I'm just unlucky. Most of the examples I've seen are stamped just Meccano around the top, or on the two-part pulley, and (in one case) around the end of the boss. Post-war ones are generally stamped MMIE, of course. Well, I thought I was doing well having spotted that the cone pulley in the very earliest manuals (the picture to the left is from June 1922) is very unlike what is considered to be the first type of cone pulley. I thought that this was just a prototype or doctored picture, as is common with Meccano manuals, but Clive Weston proves me wrong yet again! Firmly in the "who would have believed it" department is not one, but two examples of this exact pulley, which is made from what appears to be a blackened bronze and has a standard Meccano bush inserted through the middle of it. Was this part bought in perhaps? It's correctly stamped, but the whole design and bushing is quite unlike any other part. 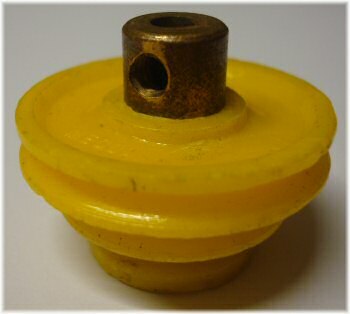 Here's another oddity, a plastic cone pulley sent to us by Jordi Fabregat. 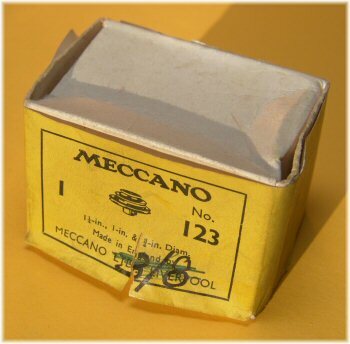 This is clearly stamped Meccano (the printing is raised, having been stamped into the mould). Is this a French part, or perhaps from the earlier Spanish production? I'll leave this in the "oddities" section until we find some more information so that we can insert it in the correct place in the table below. The photo to the right shows the post-war boxed cone pulley, part 123. The label has no part code (dating it to before 1954) and the white box I believe brings it further back still, to perhaps 1950 or just before. 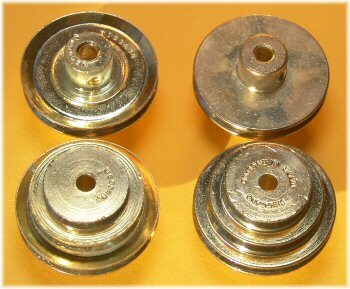 There is a nickel plated cone pulley together with some other rare nickel plated parts on eBay at the moment. There is a Lathe in the January 1941 Meccano Magazine which uses a pair of Cone Pulleys. So far, the only model to use them working!